A few days ago, to be exact, on the 17th of September, Japan approved new security bill, which the Liberal Democratic Party has been wanted for a long time. In the last few months or more, there have been many protests and demonstrations on the street agains the approval of this new bill. But after all, their shout didn´t seem to affect the decision of PM Abe. What surprised me was how they approved the bill. Although the majority of the councilors are either LDP, there are opposition parties. We probably believed until that point that when it comes to a bill approval, all of the councilors would vote and open the result in order to approve. But it was nothing like it. What does democracy means?, I thought. It was absolutely unexpected for the opposition parties and the parliament became completely a chaos. This entire eight-minutes-drama was shown in the Hodo Station on the 17th of September. The presenter made a comment, “I think this was a steamrolling”. I agree. Asahi Newspaper later explained what exactly happened on the paper. “Eight minutes show of a steamrolling. It was a vote among angry voices, however the script was well prepared. On the 17th, around 4:30 pm, no-confidence motion against Yoshitada Konoike chairman of the Upper House special committee was rejected. Mr. Konoike who was waiting outside came in the committee room and sat on the chair. It was when Democratic Party director, Tetsuro Fukuyama walk over to the chairman seat while talking to Konoike, “what is the next subject?”. About 10 LDP councilors who were waiting at the back of the room suddenly packed down around Mr. Konoike to protect him. At the same time, PM Abe took a seat then the Defence Minister, Gen Nakatani and Foreign Minister, Fumio Kishida sat down. The committee suddenly changed into the moment of voting for the new security bill. The opposition parties were unaware of the situation and rushed to the chairman a second later. The lead director of LDP, Masahisa Sato who was right next to Mr. Konoike gave a sign to a councilor, Ichita Yamamoto and he stood up and started to read un urgent motion that said, they would finish questions and answers and immediately move on to the vote. PM Abe, disregarding the chaos, left the committee room without seeing the result of the vote. Meanwhile Mr. Konoike read out the procedure of the vote but no one could hear him. The lead director of LDP urged the ruling party members to stand up. 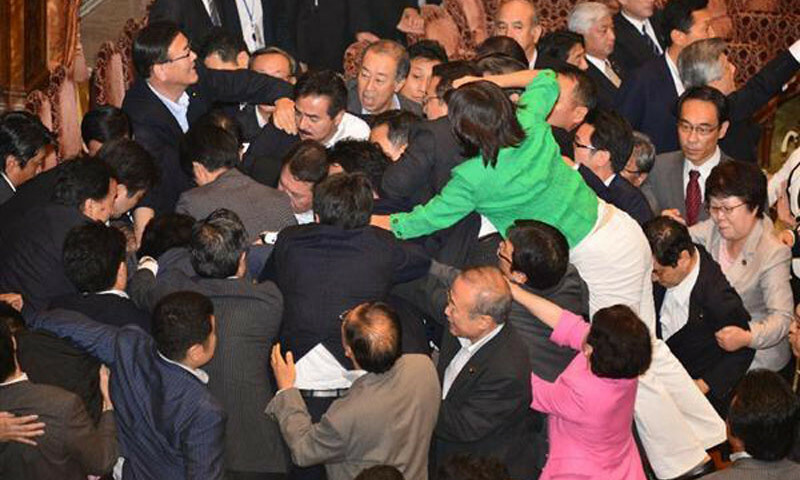 DP councilor, Hiroyuki Konishi jumped into the scrum of the LDP members but was removed by the LDP lead director. This is how new security bill was approved. The opposition parties shouted, “invalid, invalid” however, the chairman, Konoike left the seat surrounded by the LDP members. Apparently Mr. Konoike had a teatre flyer of a manga, ONE PIECE in his pocket to prevent from being taken away the procedure plan by the opposition members. LDP party steamrolled the bill not only once but three times. One was to finish the question and answer and start the vote. The second was to approve the new security bills. And the last was the international peace support. All approved without any legal process. Almost everyone tell you how corrupt their government is with the face of resignation. Sure none of the government is perfect but if this outrageous behaviour in the parliament is called “democracy”, I have a lot of doubts about it. To have own military may be important for Japan instead of relying on the US army but I think this is illegal and should be questioned officially. Is this what happens to your country too? Is this something normal for a government?